I can still remember my mother trying to correct my speech by saying “Ain’t isn’t in the dictionary, Kristin.” It is now, Mom! English is a such a rich, wonderful language precisely because of the way it evolves and embraces new words and usage. An important part of continuous education is understanding how your customers communicate. Successful businesses not only listen to what their customers want, but how they say it. If you’re marketing to teens, for example, you need to know that an emotional appeal might give them so many feels that they can’t even. And that this is a good thing! Chocolate and peanut butter had a meet cute back in the 80s, and millions still ship it (it’s one of my OTPs). 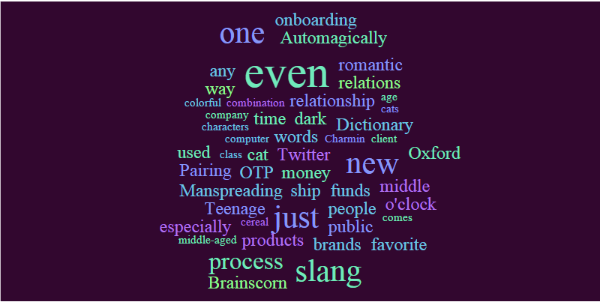 What words will make the cut in 2016? I’d love to hear your predictions. My bets are on “dark money” and “Khaleesi”. Kris works on the Commercial Marketing team at TDS Telecom and helps TDS achieve their online objectives through digital marketing and website optimization. She has worked in the digital marketing space for over 15 years, in product categories as diverse as shoes, banking, beds and pig farming supplies (really!). Kris has both undergraduate degrees and an MBA from the University of Wisconsin - Madison and therefore bleeds Badger red. She’s a veteran blogger on topics ranging from digital marketing to Wisconsin fish frys to the sweet necessity of ugly office sweaters. Nowadays, you’re more likely to find her on Twitter or Google+ trying to decipher the mysteries of A Song of Ice and Fire. In her spare time, you can find Kris kayaking, hanging out at the dog park, or thinking about lawn care.